I feel kind of weird posting this, as it's been a secret we've been keeping...but I have some news I wanted to share with my dear readers today. 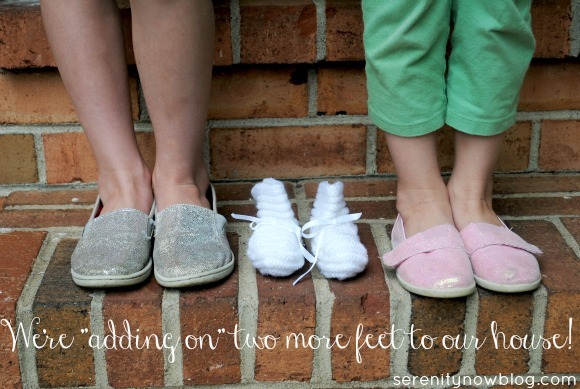 Yep, we're "adding on" two more feet to the T household, literally. For the sake of keeping things real, I'll share more later this week. Things haven't exactly been a walk in the park, so to speak, and I know that's been reflected in my personal life and here on the blog. For now, I just wanted to share our news with you. I have a cute video of the creative way we told the girls (who were over-the-moon thrilled), so I'll have to show you guys that next time. If you enjoyed this post or found it helpful, I'd love for you to click your "Pin It" button to add this post to Pinterest, or a +1 for Google+. And I always appreciate kind comments! Congratulations, Amanda. I know the girls can't wait to meet "their baby". Congratulations! I am so happy for you and your family! Awesome congratulations Amanda!!!!! Can't wait to read more details! So happy for you Amanda!!!! Congratulations and take care dear!!!! Oh my goodness, congratulations!! That's so exciting! Congrats that is awesome news, hope you feel better soon! I love the pic with the feet. Super duper congrats! That is so exciting! Congratulations. Can't wait to meet the new little one. AHHHH! Congrats! So excited for you guys! Congratulations! I look forward to hearing more. Congratulations! We have three as well, and although it's chaos sometimes, it's happy chaos. :) Wishing you much joy! Many congratulations to you and your family! What a blessing! I wish you a safe and healthy pregnancy and can't wait to read more! Congratulations Amanda! The girls I am sure are eager and ready to lend a hand. Congratulations. Hoping you're feeling better soon! Congratulations!! Praying for a safe and healthy pregnancy! awww so amazing - congratulations!! Oh my goodness!!! Congratulations!!! That is so exciting! I'm wishing you all the best! Congrats, Amanda!! What exciting news! And I can't wait to see the video you made for your girls...how fun! Ahhhhh! Wow! Congrats to you and your family!! So exciting! Can't wait to hear more!! Such wonderful news, Amanda! I hope you are feeling well. Congrats to you and your family! Congratulations! Very happy for you all! Congratulations! Cherish every moment of this time, it really does go too fast, somehow I have a 9 month old when it feels like I was just sharing my pregnancy news. Hope you have an easy pregnancy and a health beautiful baby! Awesome! Congratulations! I totally understand the feeling of it not being a walk in the park. Hope things stay to level out soon for ya. So happy for you. I can't wait to hear more about your new addition. I have had very difficult pregnancies, I hope all goes well and you are feeling (or will feel) great very soon. Thinking good thoughts for you! Amanda, that is so wonderful. I hope you have an enjoyable pregnancy. Congratulations.